Honor has launched Honor 8A Pro Smartphone. It has a 6.09-inch HD+ LCD display (1560 x 720 pixels) powered by MediaTek’s Helio P35 SoC with 3 GB RAM and 64GB of internal storage which is further expandable with MicroSD card. Dual SIM device runs EMUI 9 which is based on Android Pie. On Camera, it has a13 MP Rear camera and an 8 MP front-facing camera. Connectivity options include 4G LTE support, Wi-Fi 802.11b/g/n, Bluetooth 4.2, and a Micro-USB 2.0 port. It has fingerprint Scanner on. The phone measures 156.28x73.5x8mm and weigh 150 grams. Packed by a 3020mAh Battery. 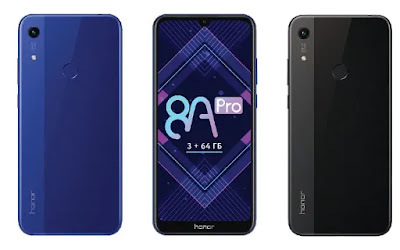 Honor 8A Pro comes in Black and Blue color options. Priced at RUB 13,990 in Russia.